CARS Hires New Staff Member! As we announced last week, Crazy Apple Rumors Site has been in the process of hiring a new staff member. Anyway, what was not revealed is that the individual we’ve been interviewing is a major player in the Macintosh community, a veritable household name. In households that have Macs, of course. But today I am pleased – nay, thrilled – to announce that the legendary Thor Samson has joined the CARS family. Yes, you heard right. Thor Samson. His name rolls trippingly off the tongue. His deeds are legendary. His sinewy biceps glisten with a fine oil. Both a mover and a shaker, Thor Samson is as equally comfortable using a Mac as he is with any of the deadly arts. Renowned for his ability to speak with trees, he is equally fluent in 17 human languages, including several forms of Cherokee that are no longer actively spoken. The negotiations were lengthy. As a matter of fact, I eventually agreed to his stipulation that, in the event of an emergency, he be allowed to use any other CARS staff member (ha-ha!) as a human shield. That’s exactly the kind of guy you want to use you as a human shield. Here’s a picture of Thor his publicist sent over and Howard scanned in. 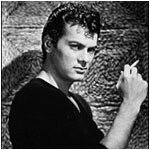 He looks remarkably like a young Tony Curtis, doesn’t he? Schiller and I pulled off the road 23 miles outside Vegas. Our all-night binge on donuts and 24-year-old scotch, slaked by nothing but bottles full of the moist dew that forms on the upper lip of female Japanese junior high school phys ed students during their equivalent of the Presidential Fitness Test had taken its toll. We relieved ourselves upon the barren sand of the desert and returned to the 1962 cherry red Mustang prototype where Gloria and Clarice lounged seductively, feeding each other strawberries and drinking whipping cream from the carton, letting it spill over their ample bosoms. Please join the staff of CARS in welcoming its newest member (ha-ha! ), Thor Samson. Next Next post: This Is Thor Samson.